Join the Jurin Roofing Team Today! Is it Homeland Security? Nope. Is it Amazon delivering your latest purchase – afraid not. That drone is actually being used by a professional roofing contractor completing an inspection of a building. 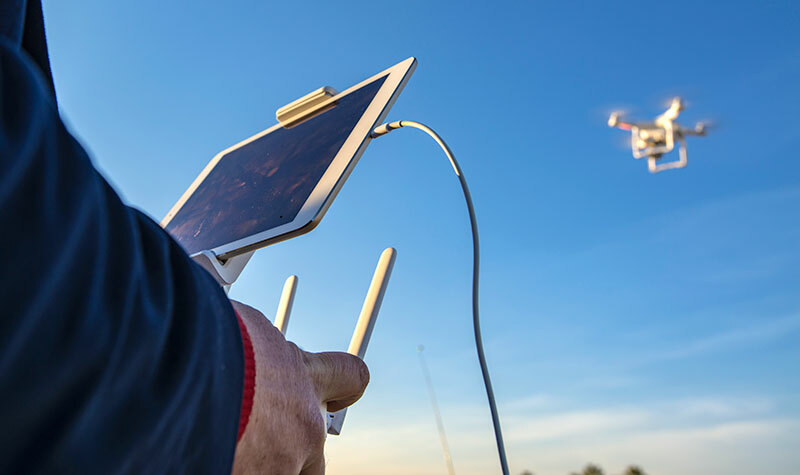 Unless you live somewhere remote in the world with no connection to the internet, chances are good that you have heard about UAVs. A UAV is an unmanned aerial vehicle, which is otherwise known as a drone. A UAV or drone is an aerial vehicle that is piloted remotely for take-off, flight and landing. Most have heard of drones being used for military purposes. However, drones are finding many other uses. Many creative pilots are finding uses in different industries including the construction industry. What does a drone carry? Drones like their much larger counterparts are able to carry other things besides just themselves. Most likely you have heard about Amazon’s plans to use drones in the future to deliver products to their customers. Just as Amazon plans on using drones to carry packages to their customers, others can fix a payload to a drone for different purposes. A common feature or payload for many drones are cameras. These cameras can be linked via bluetooth to a screen on the remote control module to allow the operator to see the images that they are capturing while the UAV is in flight. This takes the guessing game out of the flight process and insures a higher degree of flight effectiveness. How can drones benefit you as a building owner? Professional roofing contractors are using UAVs or drones to provide different services and benefits to customers. As drones are continued to be developed and deployed, the opportunities for new services continues to grow as well. There are many buildings and structures that are difficult to gain access to. There may also be obstructions or building features that make access difficult or dangerous. Using a drone can help minimize costs associated with accessing these areas. They can also keep individuals safely away from sources of danger during the inspection process. An example of a difficult to access area would be a church steeple. Jurin Roofing Services Inc. has worked on many different church structures and in particular church steeples. Typically older structures have a much higher pitched roof structure which makes accessing these types of building features difficult. Using a drone to complete a roof inspection allows quick access to these areas without setting up scaffolding. This results in a faster assessment with a reduced cost. There are many times where buildings are connected to the power grid at an external exposed point on the building. These areas can present waterproofing issues and require closer inspection. 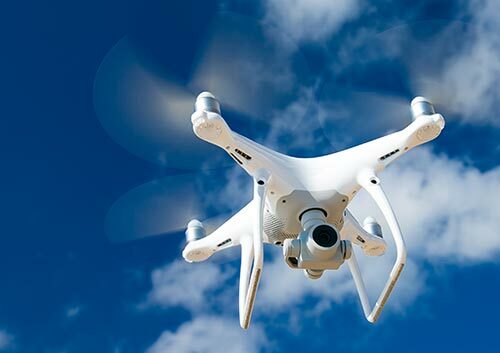 By using drones, the operator can remain at a safe distance away from the power supply but still be able to assess the area for waterproofing problems that require attention. For many reasons building owners and managers like to have aerial images of their buildings. They may use these images for documenting the condition of the existing building for insurance coverage. The images may be used for planning and development of the property. Aerial images allow building owners and managers to be able to gain a better oversight of their property. A primary factor in the long-term performance of roofing systems is the drainage of the roof system. Roof systems that provide better drainage and limit the ponding water on the roof system perform better long-term. Aerial imagery provides a better opportunity to assess the overall drainage patterns of the building. Aerial imagery services can be costly. Building owners and property managers are forced to wait for the aerial imagery company’s schedule which may take several months before they are in the area of the building. In addition, the aerial image company is not capable of interpreting the images to help determine the current drainage patterns for the building or other features of the roof system. Using a professional roofing contractor who deploys drone technology can be a quicker and more cost effective solution for building owners and property managers. Many building owners and property managers have used infrared scanning services to help assess the condition of their roofing systems. Infrared technology is used to locate trapped moisture within roof assemblies. Infrared cameras are able to assess infrared energy being emitted from roof systems and capture images of the energy patterns. The images can then be interpreted to help determine potential areas of trapped moisture. There have been two traditional methods of capturing infrared images. The primary method has been to deploy boots-on-the-roof technicians with handheld infrared cameras to perform assessments. The other option has been to contract with an aerial infrared thermography company. These companies operate manned planes with an external mounted infrared camera to do flyovers to capture these images. The use of a manned plane is costly and time consuming. New UAVs or drones are now able to carry an infrared camera as a payload. There are benefits to using a drone affixed with an infrared camera. Drones can be a more cost effective solution as the technology can be deployed locally at the site instead of flying from a remote airport. The drone can be flown for a fraction of the cost of a manned plane. In addition, the drone can hover over the target and capture more images when compared to a flyover taking place. As with any other technology, drones are not the answer in all situations. There is no substitute for a professional roofing contractor being able to step on your roof system and complete an hands-on assessment of your building. 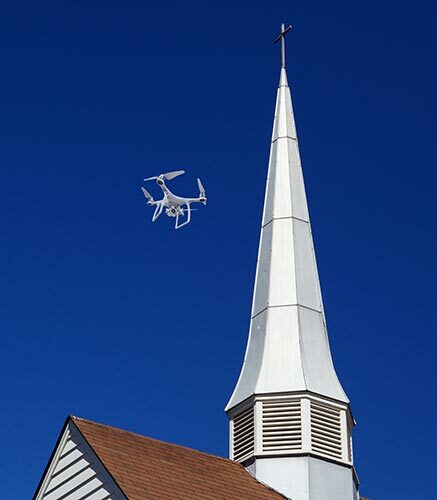 Drones are like any other tool that a professional roofing contractor uses. They are an extension of the individual. UAVs enhance the ability of the roofer to do their job and provide quality services to their clients. Do you have a building or structure that can benefit from implementing drone technology? If you are interested in drone services for your roofing assets click on the button below to learn more. Yes I’m interested in finding out more about drone services! Drew brings with him years of management and customer service experience. His primary background is within the aviation industry as a Commercially Rated and Small Unmanned Aircraft Systems Pilot. He hopes to utilize his drone experience to create a more well rounded landscape for the roofing industry. The most important aspect he hopes to achieve is to build lasting relationships with customers through our consistent quality and tireless effort. Jurin Roofing Services, Inc., established in 1974, is a full-service commercial roofing contractor with over 44 years of experience in roof maintenance, roof and leak repair, roof-over, and roof replacements. We also offer professional roof consulting services and roof infrared scanning. Jurin Roofing Services, Inc. is an authorized roofing contractor to repair and install for all major roofing manufacturers.